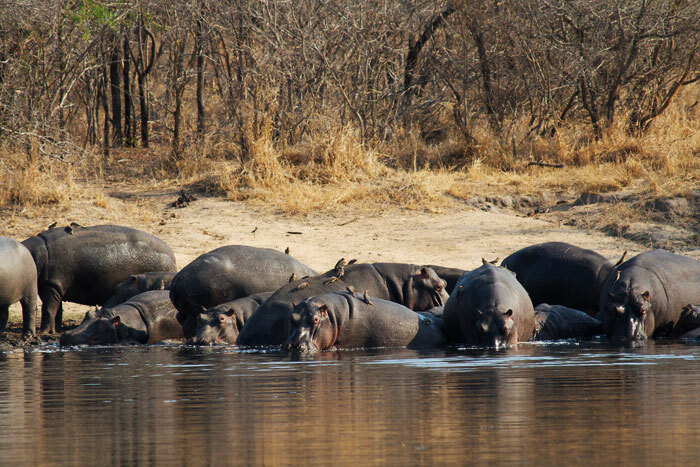 During the winter the hippos at LTA Dam were almost always out of the water during the day, trying to warm up. Now that it's getting warmer, however, they seem to have made a compromise, staying half in the water during the heat of the day. 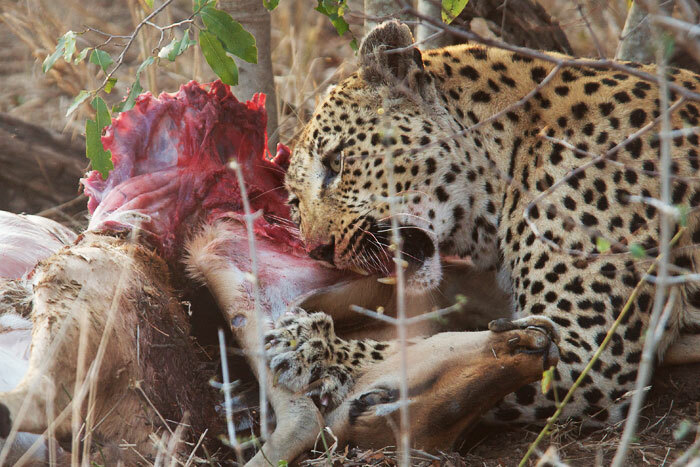 The Maxabene Female feeds on an impala kill after having stashed it under a bush. We were hoping to have the opportunity to see her hoist the carcass in a nearby tree, as night was falling and the hyenas would most likely be lurking. No such luck, however: she filled her belly and left the kill, perhaps having enough faith in her seasoned hunting skills that she could get another when the time came. 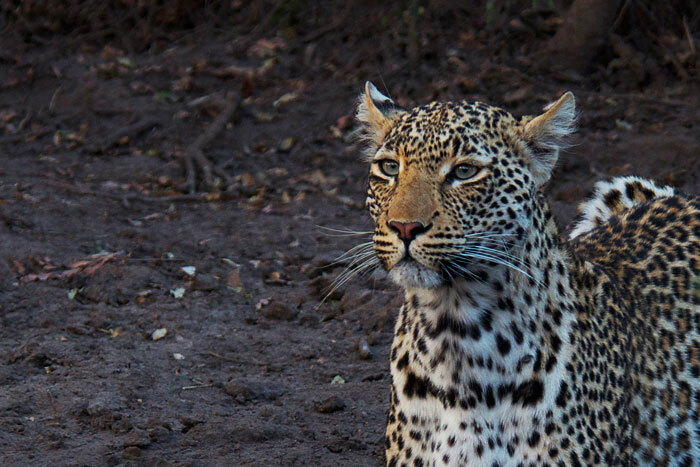 After feeding, she spent the last moments of light peering at the sunset from a nearby termite mound. 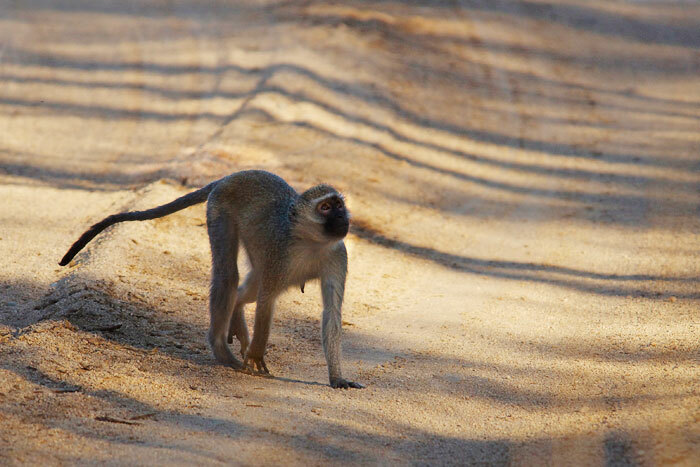 A Vervet monkey looks to her companions in a tree, who had made an alarm call. It turned out to be a leopard, but he was far away and uninterested in the monkeys. The Camp Pan Male is truly in good form. 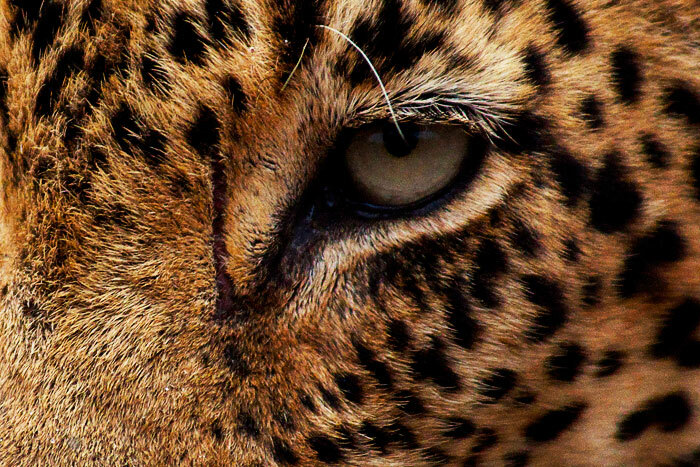 Despite his fading colour (the signs of aging), this dominant leopard is bigger and stronger than ever. Perhaps his eyes slightly too big for his stomach (or claws), the Camp Pan Male stares down a giraffe. We found him this rainy morning because the journey of giraffe we had stopped to look at were suddenly startled, and upon closer investigation we found Camp Pan stalking one of the calves. 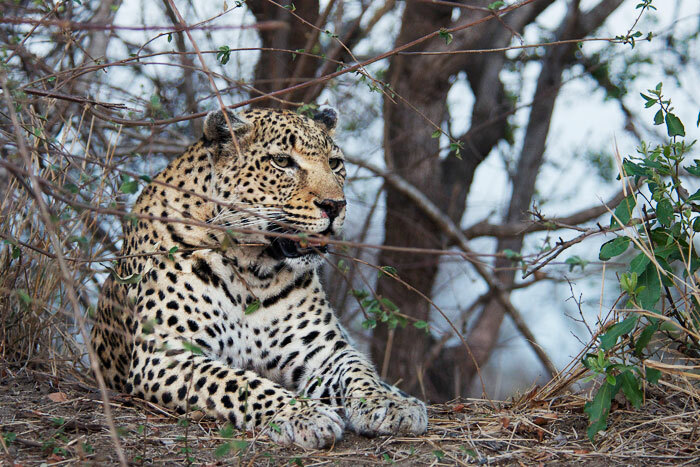 He was unsuccessful, but my comments in previous blog posts eluding to his tendency to take the easy route by stealing kills from other leopards have hereby been put into check! 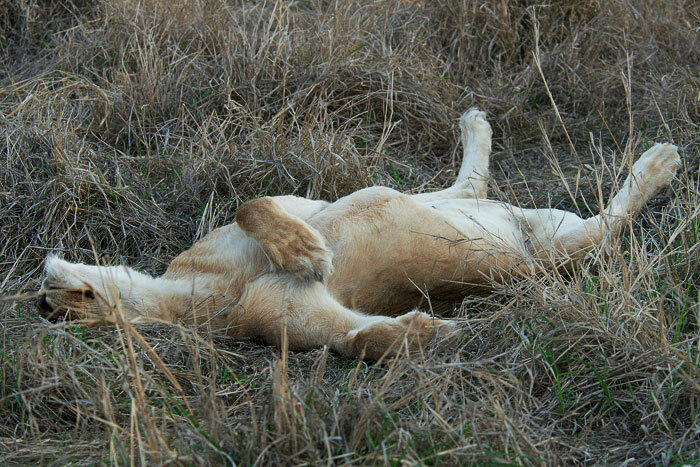 We all laughed when the Tsalala lioness dramatically flopped into this position. However, it is also sadly fitting to the tragedies the pride has endured of late. This week we had yet another scare with the absence of one of the older youngsters in one sighting, but I am happy to report the following day the missing cub found her way back to the family. 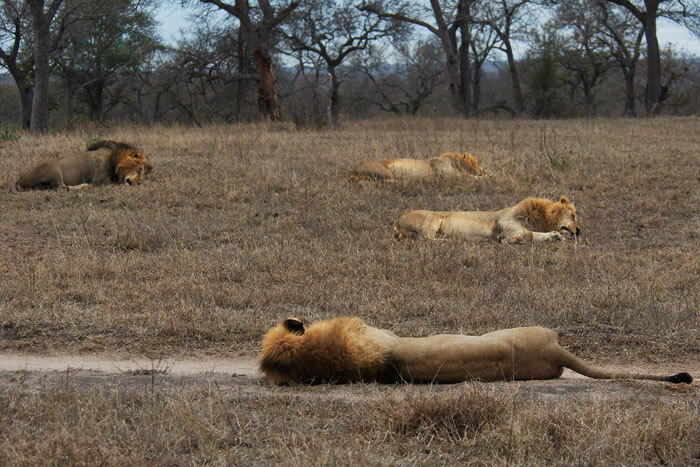 When we found the Tsalala Pride this week, the lionesses were resting on their own, without the cubs. 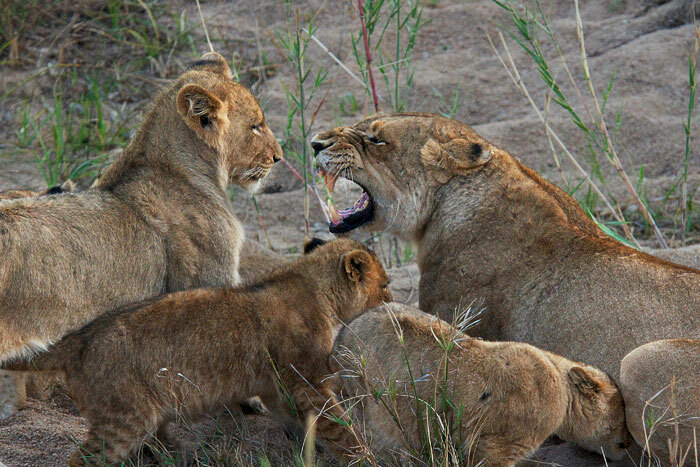 But soon after, one of the lionesses walked down into the Manyeleti River and called softly - and the cubs came running out. As the little ones went to nurse, one of the older cubs was told in no uncertain terms to stay away! 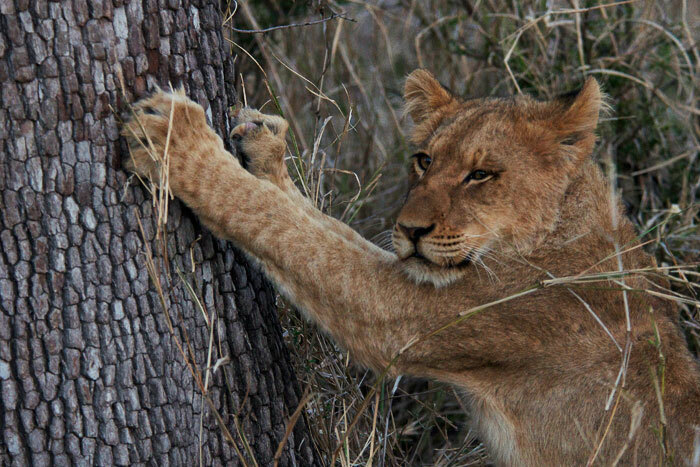 Perhaps sulking after her scolding, one of the older cubs decides to sharpen her claws on a nearby Leadwood tree. What a treat to have all four Majingalane Males together this week! This is a rarity - usually the Coalition members can be found on their own or with one or two others, but rarely all together. Clearly confident and relaxed in the heart of their territory, the four lions slept out in the open for the entire day. There is a friendly competition amongst the rangers who take photographs to capture all four of these males together... but this is a good example of, just because they're all together doesn't necessarily mean you'll get a great photo! 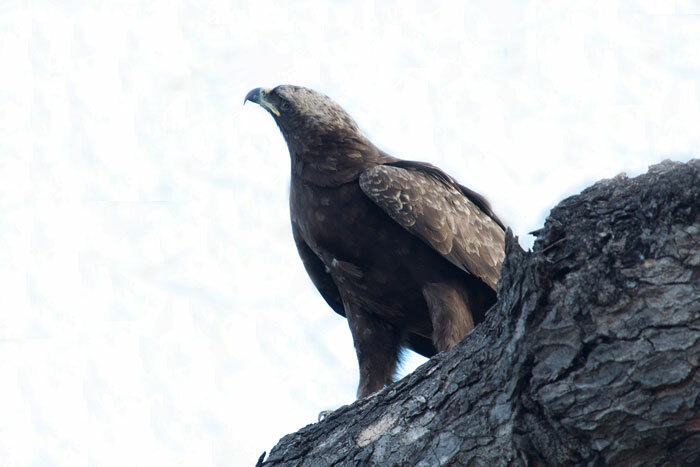 A Wahlberg's eagle looks up to its nest in an adjacent tree. The Nyeleti Young Female looks nervous, sitting up from her slumber. She had heard some branches cracking nearby. It turned out to be two young elephant bulls playing, who didn't seem to notice her when she walked by afterwards. 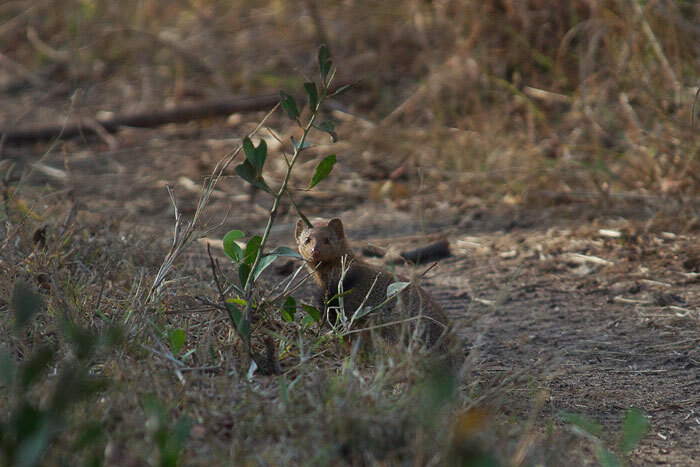 This elusive little creature - a slender mongoose - is extremely difficult to view for longer than about 3 seconds! One of the solitary mongooses, they are often spotted running quickly across the road, only to disappear into the vegetation. This one, however, posed nicely for us - the first photograph I have ever been able to take of the species! 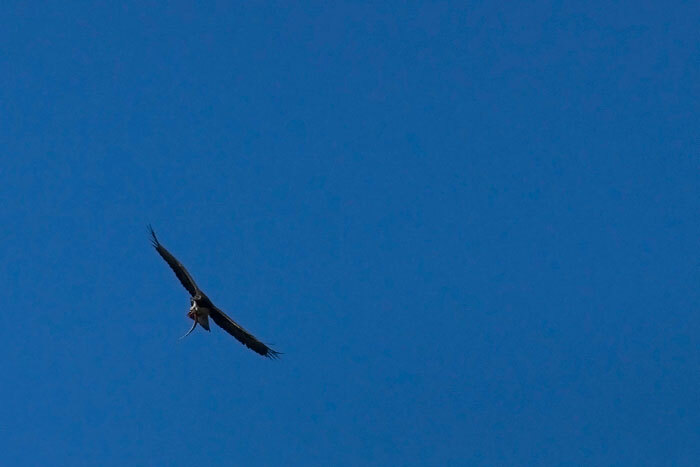 A Martial eagle flies across the sky on the first clear morning in days, carrying a monitor lizard - common prey for this bird. 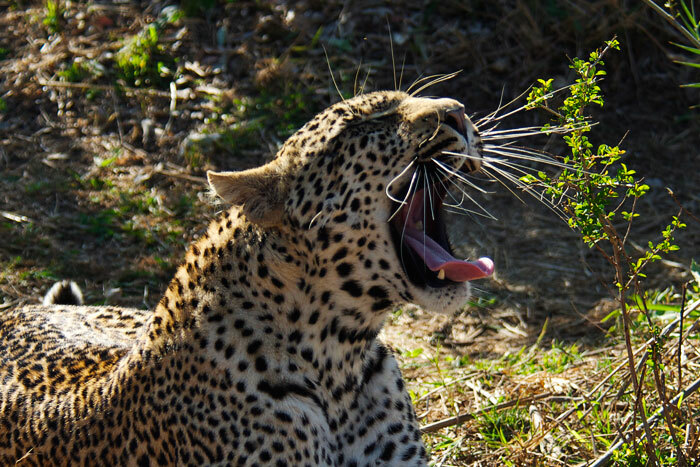 The Nyeleti 4:3 Young Male yawns before getting up to hunt. 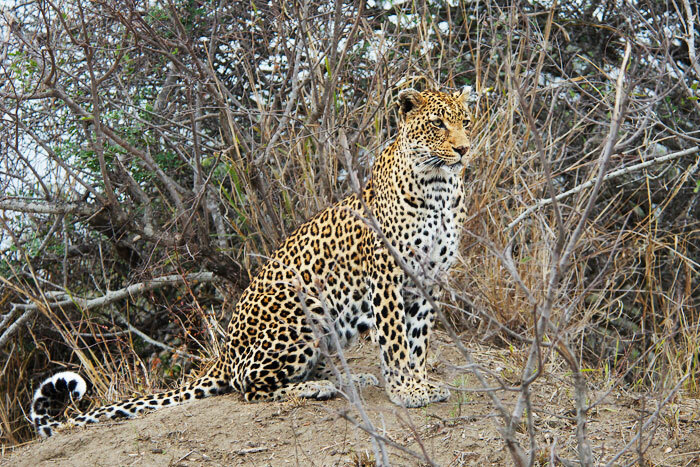 He is spending more and more time in the Sand River, close to camp, as his father, the Marthly Male, seems to be pushing further south, into Camp Pan's domain. 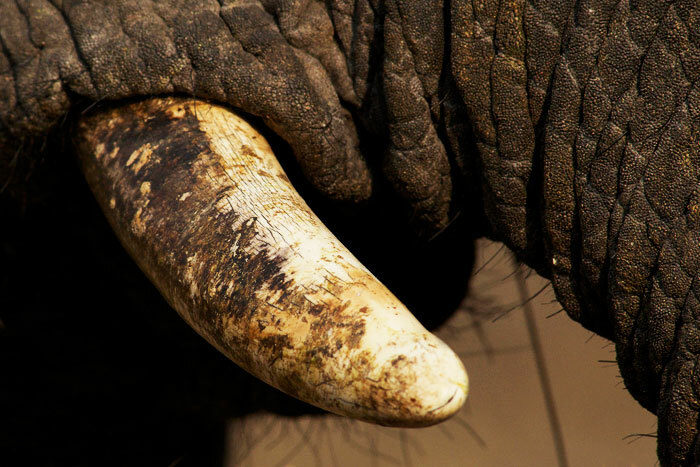 A close-up of a young elephant's tusk, showing the wear and tear these important tools endure even from an early age. A large white rhino bull gets an afternoon cleaning by some oxpeckers. 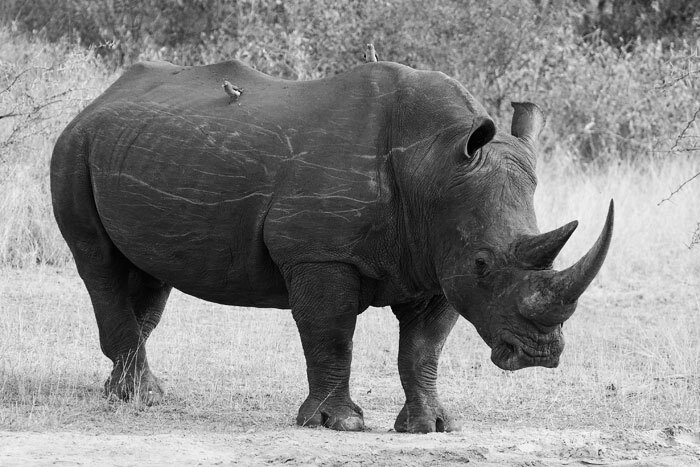 By the size of his horn, we estimated him to be in his forties. 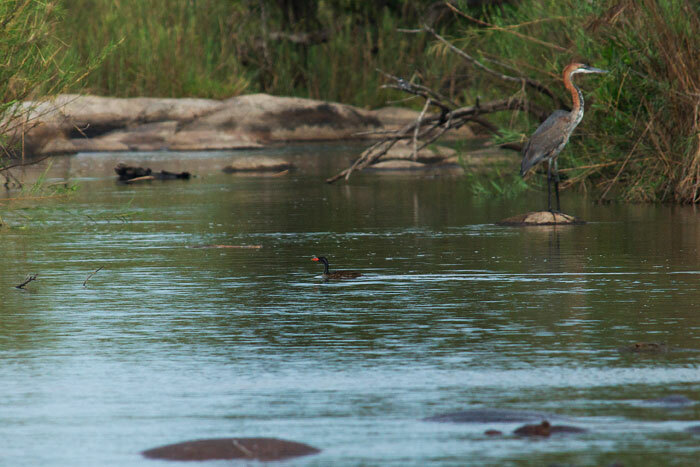 Whereas some people would be excited about the float of hippos in the foreground, or the Goliath heron in the background, it was the small black bird in the middle that captured our attention the most. An African Finfoot, a shy and rarely seen waterbird, crosses the Sand River in pursuit of its mate on the opposite side. 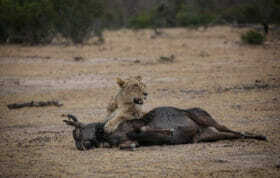 Another sighting of the Tsalalas this week found the pride on a freshly killed buffalo. It is amazing to think that these lionesses are able to regularly kill adult buffalo, all by themselves. After the frenzy was over, one of the older and one of the younger cubs were still very hungry! 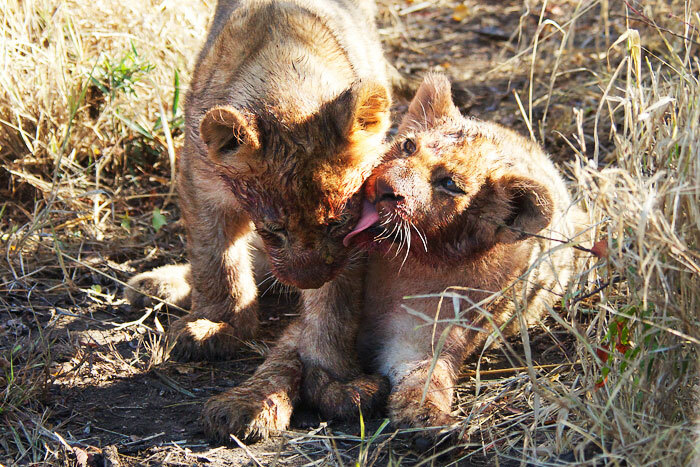 The two younger cubs help each other clean off after feeding. One of the younger cubs came to have a look at us after feeding, before falling into a deep food coma! The Vomba Female shields her eyes from both the light rain and the flies as she searches for bushbuck to hunt near Ronnie's Dam. 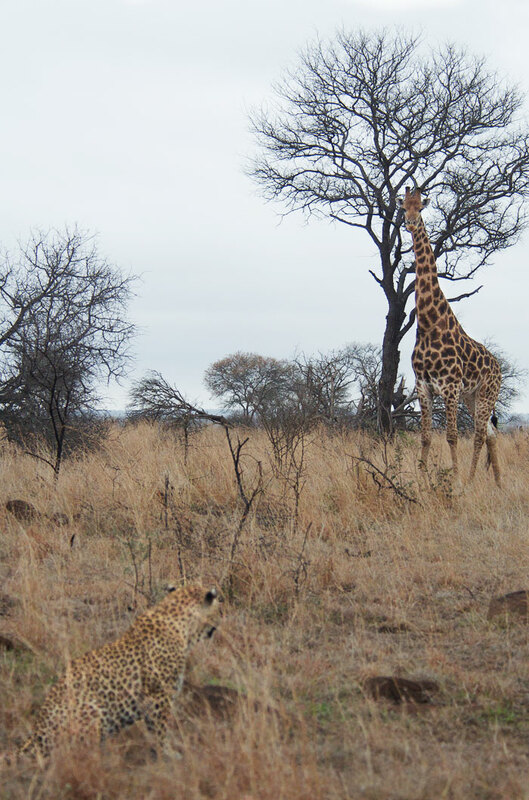 Shortly afterwards, Vomba used a termite mound for elevation to scan for prey. She would eventually spot a bushbuck, descend from the mound and stay frozen in thick cover for fifteen minutes, only to have a large hyena barge in and scare the bushbuck off, spoiling her hunt. 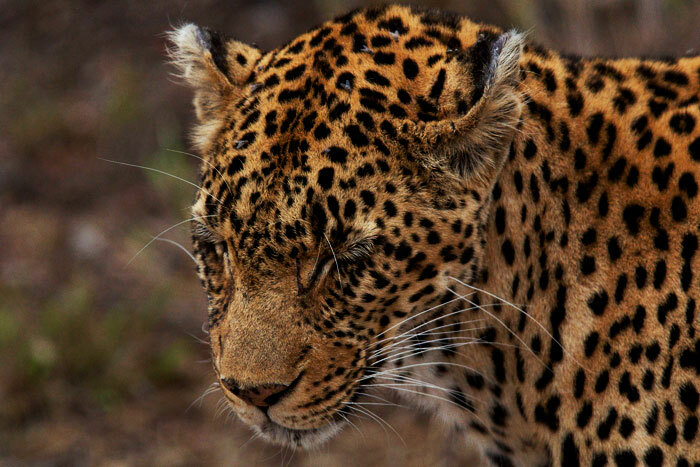 The rain droplets on her face and the scar next to her eye are further reminders that life in the bush is not always so easy for animals like the Vomba Female. Just beautiful! Thanks for these wonderful images on this Friday afternoon. Always a treat to read your blogs & see the pictures. Would your lodge ever consider putting a live stream cam at one of your watering holes? People from around the world enjoy watching the ones at Vuyatela & Nkorho. Viewers ‘man’ the cams remotely from home 24/7. It would be great to have another view from Sabi Sands. This series of photo’s is breathtaking. The captions really capture the essence of your daily adventures, really awesome, Thanks! I am awed by how you manage to deliver even better, and always different, photo’s week on week. SENSATIONAL! I think Penny Parker said it right! What a slice of Africa I get to enjoy everytime! Thanks so much guys, I absolutely love it that you read the piece every week! Plus I love your comments and feedback. If there are ever individual animals you’d like to hear more about, please let me know! 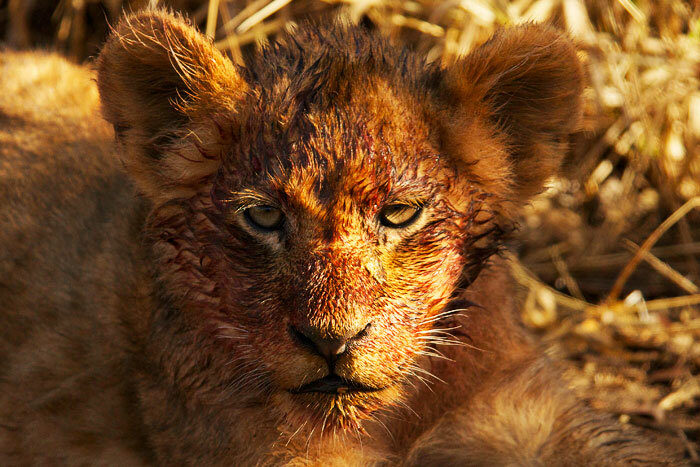 Every week you stun us with your photos – the portrait of Camp Pan is a melt down, and the cubs – and the mongoose – Talley they are all wonderful!! I could rave on all week about how good they are !!! 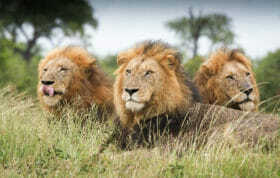 I love the photo of the four Majingalane males, as you state it shows their carefree existence, and power. Another fantastic post, love the captions as much as the actual pictures! These pictures just brighten up the end of a long week. It makes me miss the bush terribly! Such wonderful and beautiful pictures! 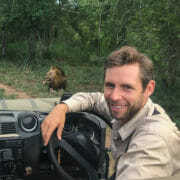 Tal, awesome to get a shot of a Finfoot-tough enough to see one let alone photograph it! As for the rest, brilliant as usual. Talley! 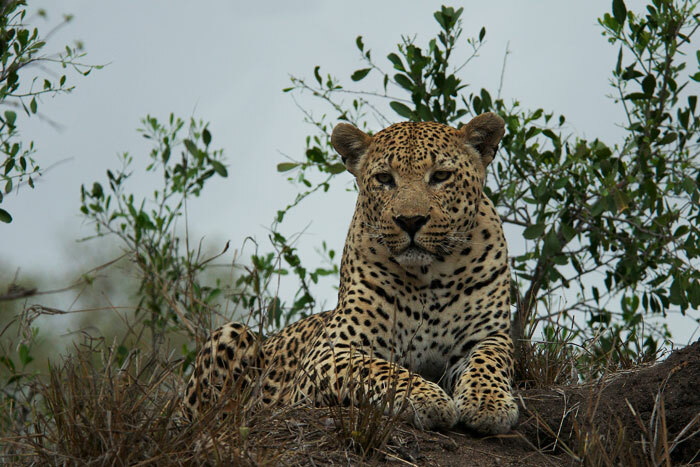 Seeing the rain on the leopard fur is yet another educational slice of the bush. You are making this so real for all of us! Thanks! 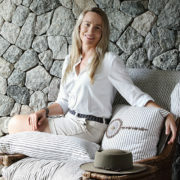 Great pics once again Talley – your stories continue to draw us in. Thank you for sharing. Seriously good Tal…. love the cubs!